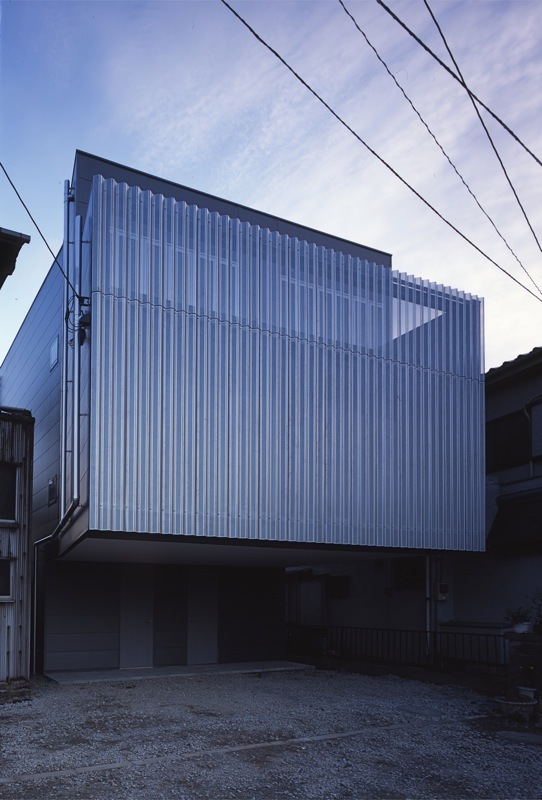 House TN is a residence that stands along the Tama River in western Tokyo. It was designed for two sisters and their respective families. Though the sisters may be close, they do have separate families and separate lives, and so living together is another matter. When designing this house, it was necessary to rethink the relationship of families and houses in an urban environment. The road in front of the site is extremely busy with a regular flow of trucks and other vehicles, and there are no satisfactory pedestrian pavements. Therefore, the site has its drawbacks including the tremor and exhaust emissions from the traffic. Even so, the families had chosen this place to build a house because it offers a marvelous view of Tama River. Meanwhile, the many factories and warehouses in the neighbourhood are also an integral part of the local identity. For this reason, the exterior walls of House TN are made of material which is mainly used for factories and warehouses, and zinc-coated corrugated and perforated steel sheets which are usually used for civil engineering are used for the front of the building facing the road. These materials give off a slightly cold and metallic impression under the sun, but at night, the corrugated and perforated sheets disappear and the warmth of the rooms seeps out into the night air. The house may almost look like a factory by day but is a warm residence by night. The three-story building is designed to accommodate two families, on the left and right, with two staircases. The units both have their private rooms on the first and second floors and the living rooms on the third floor, but the interior of each house is designed in totally different tastes according to each family. The two units are called “the black house” and “the white house” from the color of their stairways. The living rooms on the third floor have folding doors that can be opened up so that the two families can use it as one large room to enhance lively communication. Meanwhile, the roof has what looks like a glass box called the Den Room, which is only large enough for one member of either family to enter. Here, it is possible to watch the horizon, meditate, and maybe learn something by gazing up at the stars, for it is only natural that people sometimes need some space to themselves. * residence for an “urban” extended family: a house that accommodates the needs of modern nuclear families who have grown accustomed to independent life but have chosen to enjoy the benefits of being part of a large family.